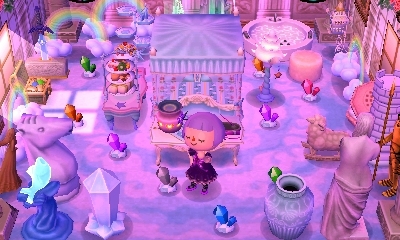 I did some fun things these two days, like decorating my new upstairs room, catching some beetles, and going to K.K. Slider’s first show in my new town! But first, on Saturday I got a look at my newly expanded house’s exterior. Now that my coconut palm is fully grown, I can catch these awesome beetles! Saturday was La-di Day, which normally I might not even participate in, if I’m already partial to my town tune. But Dafdilly is a new town and I haven’t come up with an official tune for it yet, so I thought I’d give my townies’ tunes a listen! Peewee got choked up when I picked his song to be Dafdilly’s new town tune. 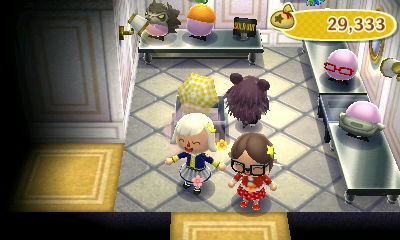 I headed down to The Roost to meet K.K. Slider for the first time in this town! Bye Rod~! It was nice having you in town, albeit briefly! This looked better in my head. 😕 Twisk’s catalog is still pretty limited, though, so I think this is the best I can do for now. A remarkable achievement, I know 😛 I buried three more shovels tonight for my other characters Bell, Harmony, and Melody to use when they turn gold. 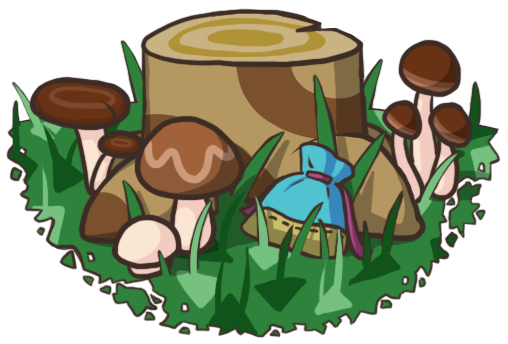 Posted on July 10, 2011 by Amy •	This entry was posted in AC:WW, Dafdilly and tagged Animal Crossing. Bookmark the permalink. haha, I always forget too! But when I do remember, I get a song with all four characters, so I guess it evens out.